Are you always buying flagships, or are you hunting for the best value-for-money ratio? Flagship phones are no doubt at the top of their game when it comes to the latest and greatest specs, software version, and overall appeal, but all of these niceties come at a price, too. It's often north of 600 USD or EUR without carrier subsidies, and 200 when subsidized, but in exchange for a lengthy (and expensive) two-year contract. Some of us just can't resist always having the latest and greatest, though, and we either upgrade and ditch what we have at a loss to acquire the newest flagship, or buy it outright at the unpleasant early adopter pricing. Naturally, the rapid pace of mobile innovation itself makes it harder and harder to cling onto a phone for at least two years, as the flagship cycle has now shortened to the puny six months for a bunch of major manufacturers. Still, whose who can resist the urge to always buy the latest and greatest, are in for a treat these days, as hunting the best value-for-money offering has never been so rewarding. Last year's flagships, for instance, come with 1080p displays, quad-core processors, and high-res cameras for half the price, and there are numerous current midrangers that give you a stellar smartphone experience for the money. That's why we wanted to ask you are always buying flagships when the mood or the necessity warrant a new phone, or are you looking for the best value-for-money ratio first? These two rarely coincide, so take your pick, and sound off in the comments. Are you always buying flagships, or are you looking for the best value-for-money ratio? I try to nab the best value-for-money when shopping for a new phone. Best value for money and you got an iPhone 4? iPhone 4 8GB version for emerging markets. Value for the money without compromising any. I buy flagships ONLY when they're on a GOOD price. 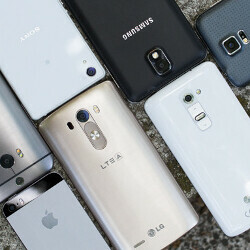 I've owned four of the seven phones in that picture lol. My phone addiction is really bad. same here. fortunately for me, i live in a country where i can sell my used phone easily (thousands of second hand phone shop) and with a good price. Nexus line is not meant to be high end phones, and NEVER will be. Great phones though. P.S. I love how no one here mention Samsung. LOL Good job ad-trolls. I buy flagships... just not every year. I have no problem to mid range devices like my moto g, but the problem is camera. The only advantage i see of spending double which i cant compromise. Flagship with best value for money is my target. But I can't even afford that. So midrange with value for money. Honestly, I've had HTC phones and liked not one of them. I had my Asus memo pad and I love it, I also WILL NOT buy the lg g3 (I own the lg g2) the g3 has only a slightly better processor a better camera and worse battery life with a bigger display. OPO FTW the best price-specs ratio phonet hat no one can buy. I think he meant one plus one that do not exist. Nexus 5. Flagship and best value. Haven't had an ounce of buyers remorse. Can't wait for Android Silver. Same here, although I regret a little bit not having bought the 32GB version instead of 16GB. I had various experiences with the battery, also depending a lot on some errors I made in variables in Tasker and Zooper. But with average use (I have about 3-4 hours screen time), the battery lasts me 24-30 hours. No custom roms yet, but I will switch to one within a month :) Also it depends a lot on the charger I use. The best results are with the original one. At work I use the one from my S3, not so much. Wireless charging is somewhere in between. Thanks. I guess I'll have to buy one of those portable battery packs. And I heard Franco kernel on nexus 5 gives extra 3hr onscreen time. It works great on my nexus 7 too.